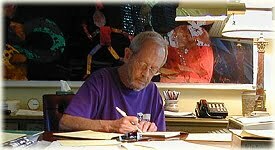 Elmore “Dutch” Leonard is one of the most prolific of modern day crime writers. He is now deep into his seventies and has managed to retain the reputation as being one of the coolest writers on earth. He has had over 30 different movies and television shows made from his works, some good (Jackie Brown, Out of Sight, Get Shorty), some bad (The Big Bounce), and some ugly (Stick). Leonard is known for his naturally eccentric characters and dialogue. He began his life as a novelist in the fifties by writing pulp western novels, and good ones too – Hombre, Forty Lashes Less One, The Bounty Hunters just to name a few. But then, when the market for westerns dried up, Leonard turned to crime fiction. I spoke with Leonard on a sunny afternoon in early February from his home just outside Detroit, Michigan. Christopher Heard: Hey man, nice to talk to you again. Elmore Leonard: Yeah, how have you been? EL: Yeah, all this stuff is swirling around…but the movies, I pretty much don’t have much to do with them anymore. EL: Yeah, exactly, exactly, because that was the last time I actually wrote a story set in Detroit. That was about twenty years ago. CH: Why did you wait twenty years to return to your home turf? EL: Well, you know I don’t really think of it like that, I get an idea and I think about it for a bit, I research it, get my researcher to dig even deeper, if there is something there then I go with it. I really just take it one book, one story at a time. CH: I know you like to hang out with detectives before you sit down to write…have things changed in Detroit in the twenty years since your last book set there? EL: Well, I hung out with Homicide detectives in Detroit twenty years ago and I went out on calls with them, sat in while they questioned criminals…when I did it for Mr. Paradise everything was pretty much the same, same class of criminals, same procedures, the only thing different was that all the cops I used to hang out with had all retired! It was a whole new set of cops this time. CH: Do you sometimes get ideas that aren’t immediately applicable to whatever book your are working on…and do you then file those ideas away until they fit in with another book somewhere down the road? EL: Oh yeah that happens all the time – I’ll tell you one story, I saw this picture once in the newspaper, it was of an attractive female federal marshal leaning against a jeep with a big nine millimeter tucked in her pants and a shotgun cradled in her arms. That picture intrigued me, there was something very tough about that woman, but she was a very pretty, feminine woman at the same time. I kept that picture around for ten years before I wrote a character based on that image into a book – she became Karen Sisco in Out of Sight (played by Jennifer Lopez in the movie version). CH: Does it get harder with each book? EL: You are exactly right about that, Christopher, I appreciate you pointing that out…it does get harder and harder to stay original and not repeat myself. I sometimes have characters from one book show up in another book. But I don’t want to get…predictable. EL: Well, I don’t really call it a sequel…I guess it is in one sense, but I thought of it more as just another story built around a character I like very much, Chili Palmer. But to answer your question, I never wanted to have several books with the same lead character because I want to explore different personalities and different pathologies…and it is also tough because when I sell a book to the movies then the movie company generally owns sequel rights, so I can’t really do it for most of the books anyway because most of the books have been sold to the movies. CH: Let’s talk about Be Cool – is it true that that John Travolta said he would never agree to do a sequel to Get Shorty unless you wrote a sequel book first? CH: Do producers or studios ever come to you to write the screenplays from your books first? EL: Not anymore, they know I won’t do it. EL: I never really had very good experiences with being that involved with the movies. It’s work, it’s hard work and it is hard work that gets stomped on by a whole committee of people, when I write a book I answer to no one but my publisher and me. I mean, I will help out when they call me and ask me too. With Be Cool I think they went through about seven different drafts of the screenplay before they started shooting – they would send them to me and I would make suggestions, but that was the extent of it. CH: What about The Big Bounce? EL: I think it’s terrible. It really doesn’t have much to do with the book at all. EL: You’re right, the first time was in 1969 with Ryan O’Neill and Leigh Taylor Young – that wasn’t very good either. I just don’t understand it, it is a mystery to me why movie producers buy one of my books and then they just gut everything out of them that made them popular. The director of The Big Bounce, a guy named [George] Armitage, kept asking me to look at the script and fix it up a bit, then every time I sent him stuff he rejected it, I guess he didn’t like it. But why ask me if he wasn’t interested in it? CH: Does Quentin Tarantino still own the rights to a bunch of your books? EL: Well he did…he owned the western novel Forty Lashes Less One, he owned Killshot, Bandits, Freaky Deaky, and he owned Rum Punch which he made into Jackie Brown, which I liked very much. But then it became clear that he was never going to get around to making all of them so rather than continuing to pay us for the rights to all of them we just asked for the rights to two of them, Bandits and Killshot, back in lieu of paying us for the continued right to hold all of them. CH: Are you anxious when a movie based on one of your books is about to come out – do you wait with interest to see how they turned out? EL: I am always optimistic, I am always hopeful that they will turn out really good. CH: It is such a different animal, isn’t it – the screenplay. A screenplay really has no literary integrity of its own, does it? A screenplay isn’t meant to be read, it is meant to be seen. EL: Yeah…now that I hear it put that way, yes you are right about that, they don’t have much literary integrity – I guess when they are based on novels they can only have as much literary integrity as the source material. I wrote my last screenplay about ten years ago…oh, I have thought about writing and original screenplay from time to time, but like I said – they are work and I don’t need to put myself through the grief of that stuff anymore. I’ll tell you a funny thing that happened recently, shows you what the movie world is like – I got a call from Harvey Weinstein from Miramax – he tells me he wants me to come up with a cool title for a movie they are working on. So I misunderstood him, I thought he wanted me to work on this film, so I told him I wasn’t really into screenplays anymore… but Harvey says, “No, I just want to pay you to come up with a cool title, that’s all, just the title.” I thought he was nuts. CH: What are you working on now? EL: I’m about sixty-five pages into my new book…haven’t got a title for it yet, I’ve been calling it A Life of Crime but that might change…It is set in Oklahoma in the 30s and one of the characters is related to one of the characters form Cuba Libre. CH: Thanks a lot for your time, Dutch. EL: Thanks a lot, Christopher, I hope we can talk again after the next one. Christopher Heard built his career out of a lifetime love of movie history and culture. His first screenplay was optioned at 21, he wrote a twice weekly movie column in a local newspaper that lead to a long, Gemini Award winning stint on the CBC show On The Arts and the creation and co-hosting role on Reel to Real for nine years. Since then Christopher has written books on a number of filmmakers, including Johnny Depp.